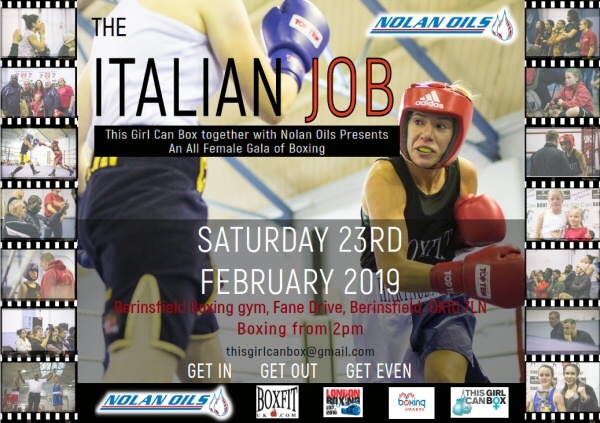 Nolan Oils are supporting the all-female boxing extravaganza – The Italian Job! Berinsfield Boxing Gym, OX10 7LN. This Girl Can Box involves a massive corpus of volunteers in the sport of boxing – unsung heroes, up and down the country – those who work tirelessly for their communities. They are proactive individuals who are not prepared to wait for governing bodies to implement events – they prefer to make things happen for their clubs and boxers through dedication and hard work. If you are a forward thinking individual, willing to roll up your sleeves to volunteer, then get in touch. If you can donate or know a company willing to back their work, please email or message thisgirlcanbox@gmail.com! Please come and support this incredible group of people from the UK & Italy – boxing is great fun for all! Funds raised are used to continually invest in developing future boxers.